It wasn't the easiest year, given Mom's passing in the spring, but it was good to see how all the siblings pulled together. 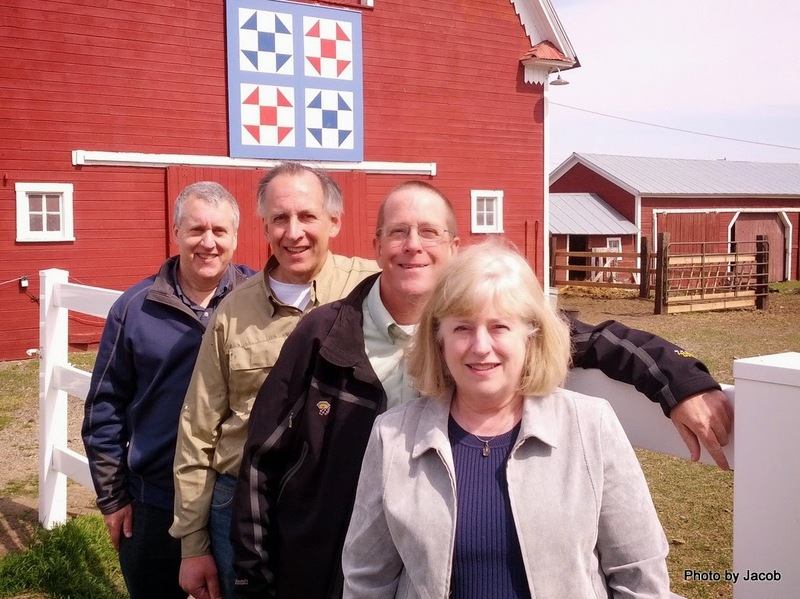 The time surrounding her last days and the services that followed was made easier by our shirt-tail relatives at Glory Farm that enveloped the whole family with love. We didn't use the Scamp as much this year as last. 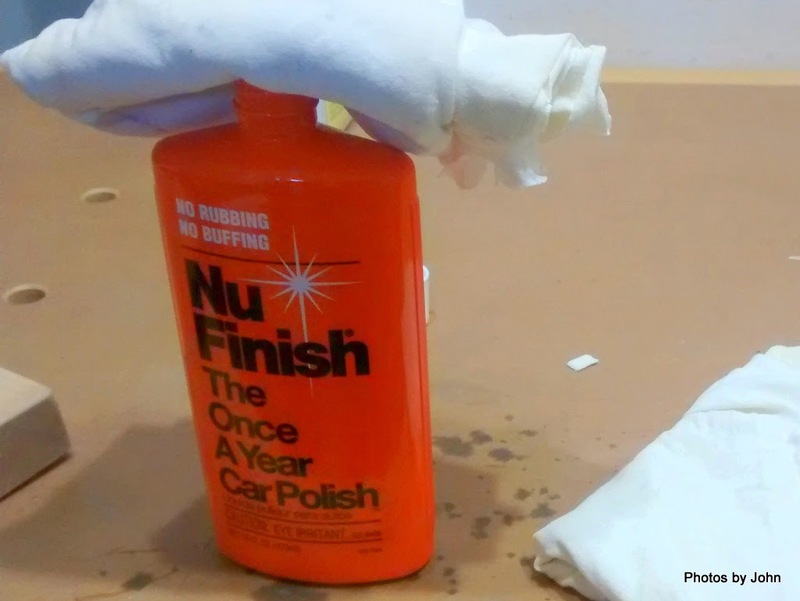 I used it 118 nights, 26 of which were driveway surfing in Bullhead City while working on Helen's dory and 10 were on my solo trip to Zion. We did put nearly 7900 miles on it this year including the 77 night trip to Nevada, Oregon, and Washington during the summer. I was privileged to join Helen and friends on her Grand Canyon river trip in March for 24 nights on the river in the canyon. BJ joined her gal friends for 5 nights of hiking, snorkeling, and kayaking in the Channel Islands in August but she couldn't be convinced to do a blog post about it. In late September & early October, BJ and I enjoyed 11 nights on the Green River between Ruby Ranch and the Confluence with my solo canoe, her kayak, and good friends . 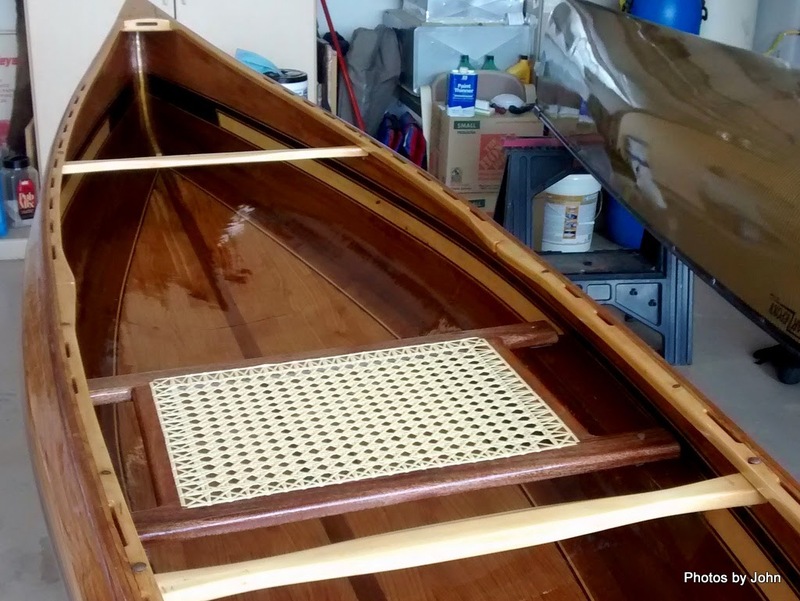 In addition to helping with Helen's dory in January, I was able to help Kathy build her kayak. It's great fun to build boats with someone else's money and making a mess in their garage! She used the kayak locally through the summer and then used it for the 11 night Green River trip. You thought I was kidding about reflections - I switched from Zep polish on the Scamp because with 15 months in the desert it was starting to yellow. The Scamp is all shiny now with a Nu Finish applied. We'll see how this stuff handles desert sunshine. We're looking forward to a new year of just finding our way around this beautiful country. On the 26th I decided we should observe Boxing Day. Seemed as good an excuse as any to meet some friends I hadn't met before. And besides, Turk needed some windshield time and a loop trip seemed the potential cure. We started out by crossing the Salt River to get to the other side, and to visit some folks who are exploring Life's Little Adventures. We'd been criss-crossing Jim & Gayle's trail for a good part of the summer, and then I just missed them in Zion last month. Gayle had commented about BJ's Christmas cookies so we started the trip by taking them some cookies and a bag of fresh citrus. I didn't get a picture of their site, but did get a later picture of part of their view. We drove north on the Beeline to Jake's Corner and hung a hard right. I don't think I'd been down this section of road since my great uncle, who lived in Sleepy Hollow, passed away. We started looking for a very well known RV blogger that we knew was staying in one of the campgrounds near Lake Roosevelt. We crossed back over the Salt River driving through every open loop of the mostly empty campgrounds. The sun was rapidly disappearing and the campgrounds were already in shadows when we finally spotted the target. It was really nice to say Merry Christmas and share some cookies and fresh citrus with her before before our refrigerator managed to eat all the cookies. Turk enjoyed the road trip and we got to put faces to bloggers that we've only known online. Maybe the Brits really had a good idea with this Boxing Day thing. We were wandering around the neighborhood the other day and I decided that I should do a special blog post for our friends Lynne & David, who should be starting their annual trek from Tennessee any day now. Some of the "streets" in Apache Junction are a bit sketchy, and they don't all go through. We knew where we were trying to go but there were fences in the way. 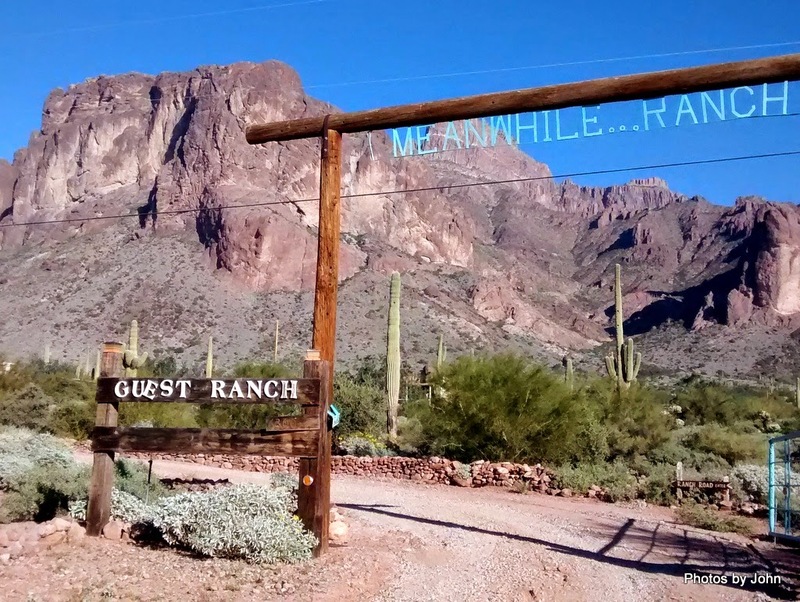 Along the way we happened onto Meanwhile ... (back at the) Ranch. Turns out, it's a Bed & Breakfast that backs up to the State Park land. They have rave reviews. I love the name! But the best part was a super convenient boondocking spot with a killer view. It's less than a mile from asphalt on an orphan piece of BLM land, but the road could well be impassible when it's wet. Hope that's enough temptation, Lynne. Look forward to seeing you soon. BJ has been busy since Thanksgiving getting ready for her favorite season of the year. 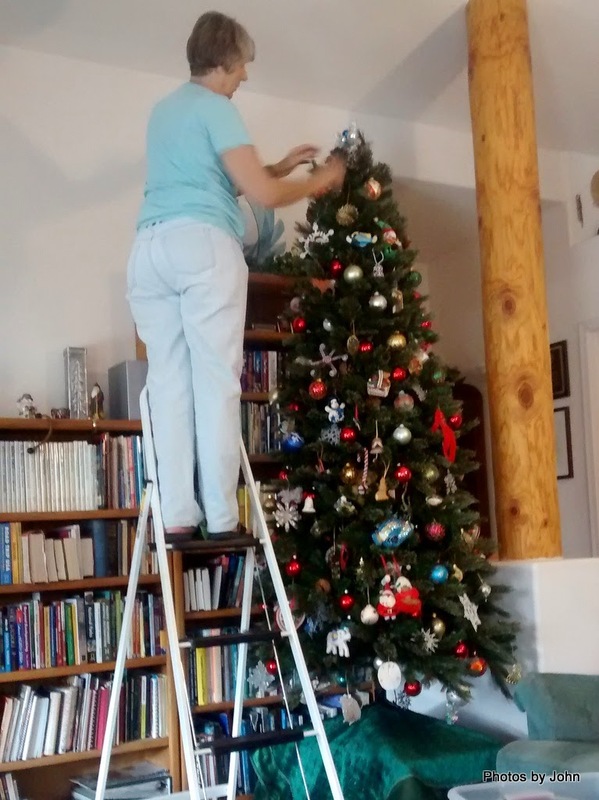 It takes at least two days to get the tree decorated at our house with the ornaments elbowing one another for room on the tree. All her handmade cards have been mailed. I'm a bit of a curmudgeon when it comes to Christmas. Retail excess that starts before Halloween turns me off although I will admit that I walked through a mall this year just to experience holiday crowds for a few minutes. All the noise and glitter tries to hide the reason for the celebration. I hope each of you enjoy a blessed Christmas. 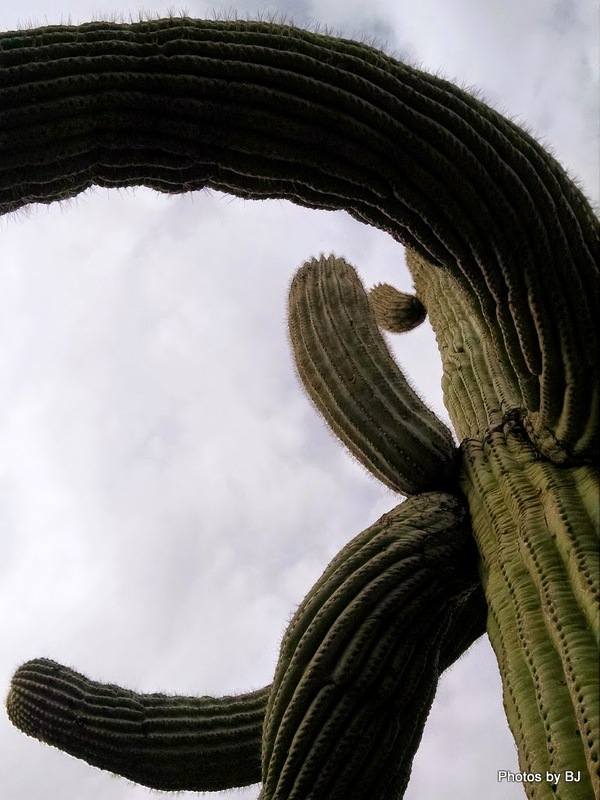 The online description that I read about this hike wasn't real specific -- "The trail starts near a mesquite tree..." Turns out public parking is not available at Saguaro Lake Ranch because of limitations of their license with the Forest Service. Park at Water Users and walk upstream to the Ranch and then chose which mesquite tree you want to use as your starting point. The trail is unofficial, and used primarily by horses from the ranch. It is very well worn in most areas and not hard to follow. The trail climbs up the hill and provides several view points of Saguaro Lake impounded behind the Stewart Mountain Dam. For an unofficial trail, it is well signed, at least in a couple places. There's another sign like this near where the 3+ mile loop crosses the Bush Highway, but it faces the other direction and says the trail ends in 1000 feet. This sign, located above the dam, seemed pretty clear to me. Along the way there were great views of Four Peaks (it was a mountain before it was a brewery!) and the Goldfield Mountains. 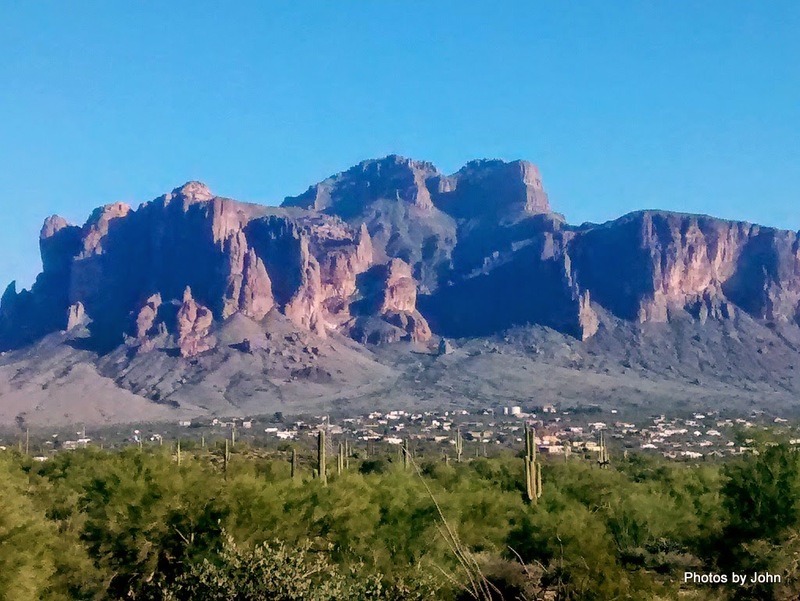 We were surprised that there wasn't any snow on the top of Four Peaks given the recent weather forecasts. 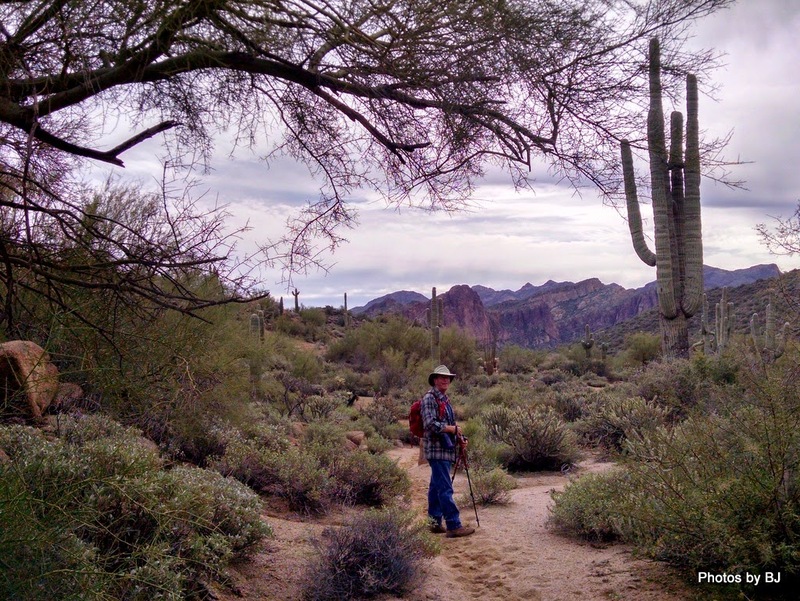 The trail passes through wonderful, undisturbed Sonoran desert with lots of Saguaro and other cacti. This one was unusual. 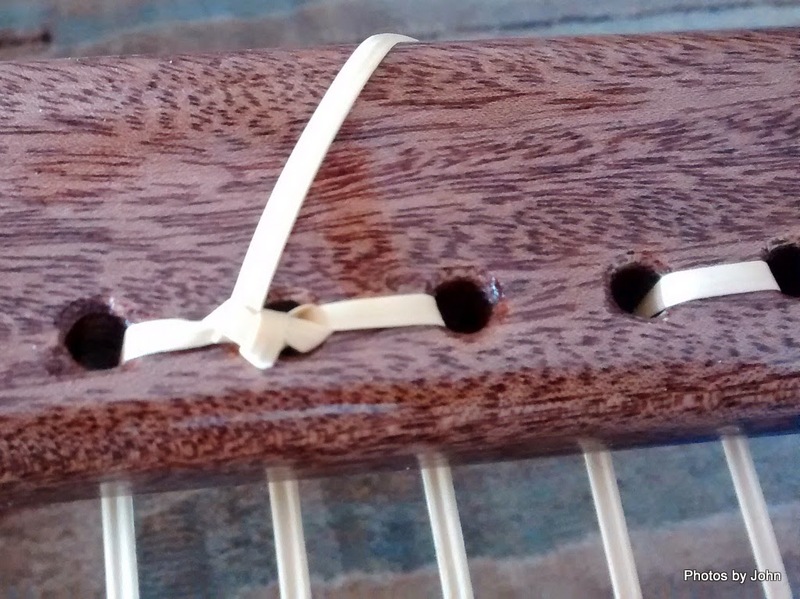 The lower section was long dead while the upper section, though once broken, was still robust. Large examples of Saguaro stand in the background with dead remains of others in front of the Palo Verde trees. and this was BJ's view. I was very impressed with the country the hike wandered through with things catching my eye all along the way. In addition to horse prints (and some used feed,) we spotted sign of coyote, deer, and javalina. This trail drops into Horse Thief Wash, the same wash that forms the back side of the Goldfield Oven loop. The wash was a worthy destination with the largest grove of mature ironwood trees that I've ever seen, some with trunks up to 24 inches in diameter. There is a pair of very large culverts that direct the wash under the Bush Highway. After passing through the culverts you'll reach the old highway alignment. A right turn will take you to Water Users river access point (daily pass required but NOT available at the parking lot $3/$6) while a left turn will take you to the ranch. 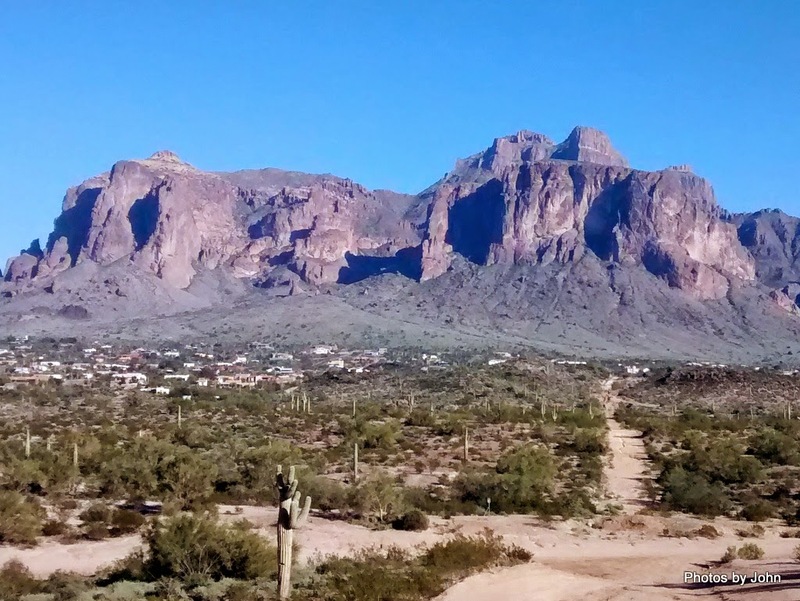 Most of the time during this hike you can see portions of the Goldfield Mountains on the far side of the Salt River. With a lot of overcast, pictures didn't do these mountains justice. 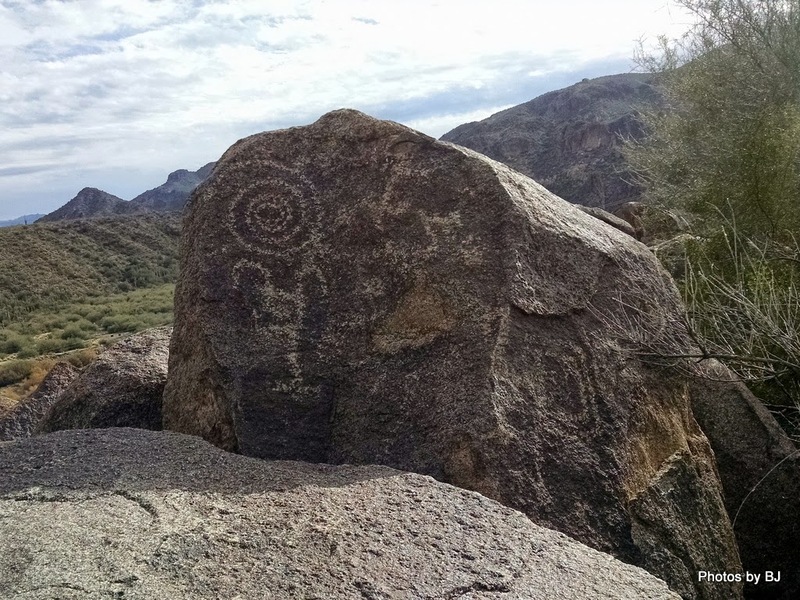 And yes, there were some petroglyphs on this hike, although I didn't thing the small collection was the highlight of the trip. I'm a petroglyph fan, but for this hike, I was blown away by Horse Thief Wash and the desert on the west side of the highway. In my mind, that was the highlight of the hike. 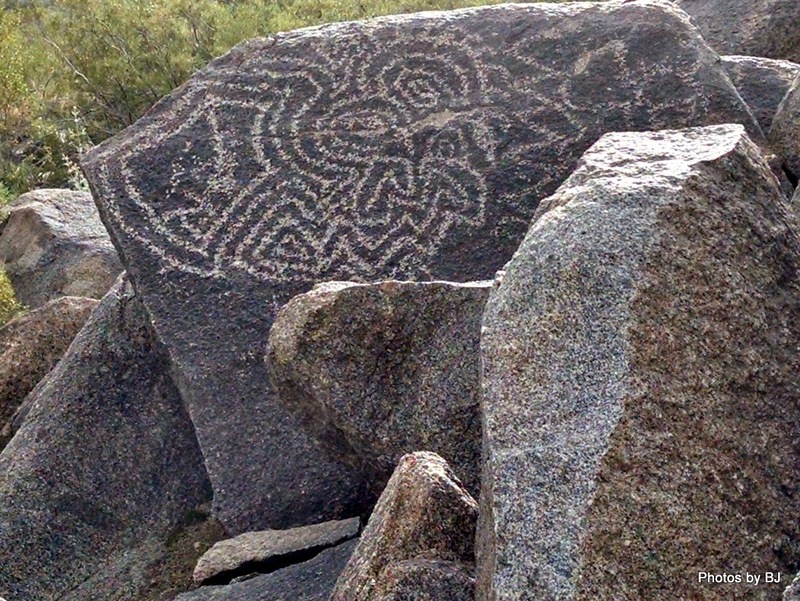 If you're really interested in the petroglyphs, let me know and I'll give you better directions. 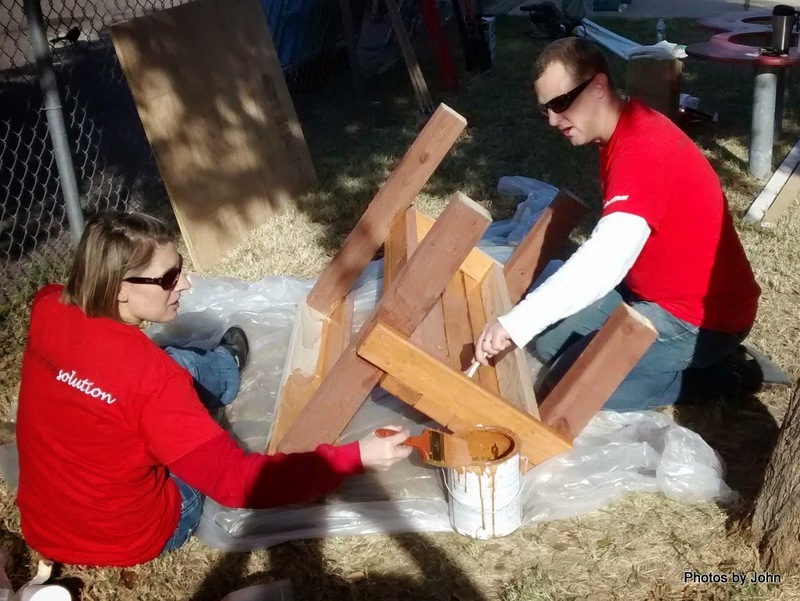 When I volunteered to paint a couple houses on "Make a Difference" day in October, I heard about Rebuilding Together and met some of their volunteers. 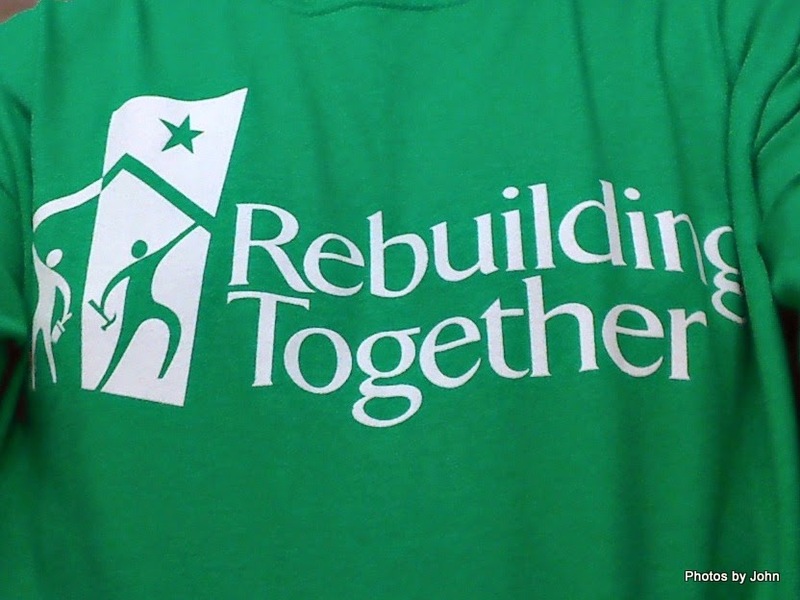 Rebuilding Together has over 175 local affiliates scattered around the United States. Since then, I've spent some time in the local affiliate's shop, building accessibility ramp modules and preparing for their next big project. 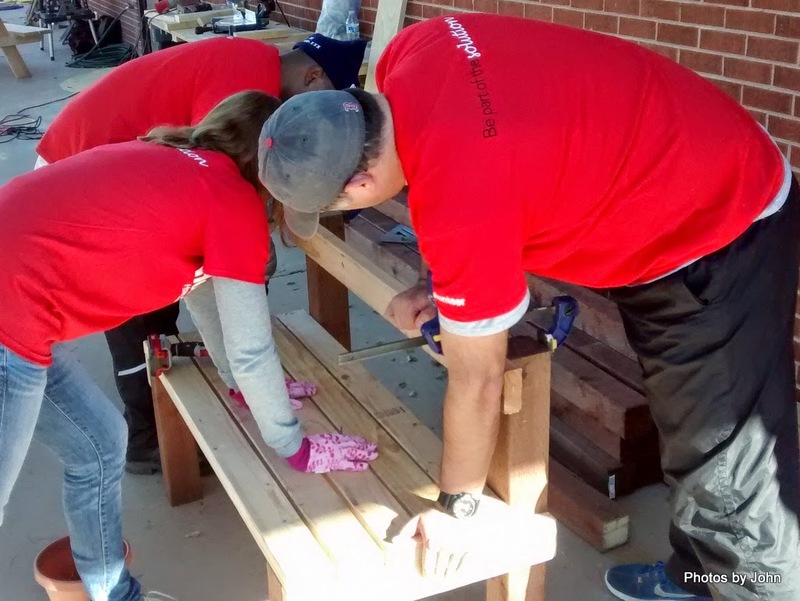 One of the strengths of Rebuilding Together is their ability to facilitate effective use of large teams of volunteers. 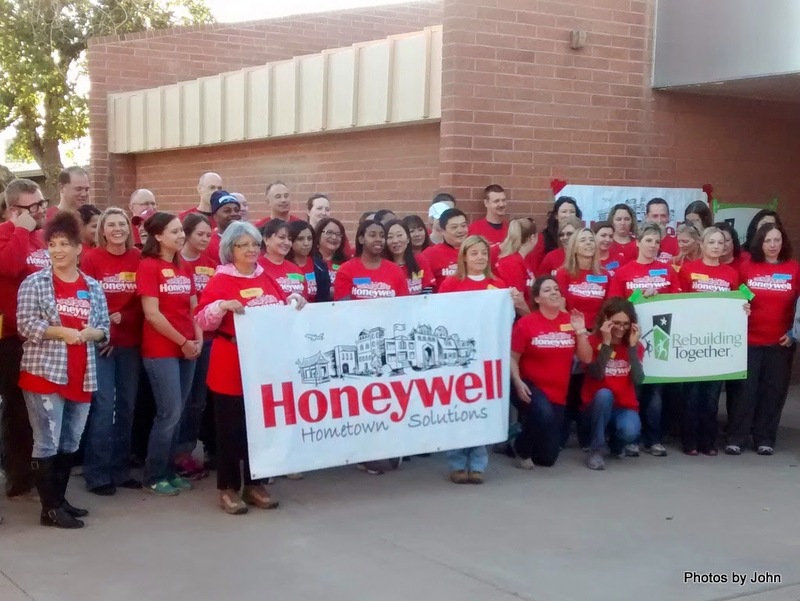 Most recently, we facilitated the efforts of over 50 volunteers from the HR department at Honeywell. 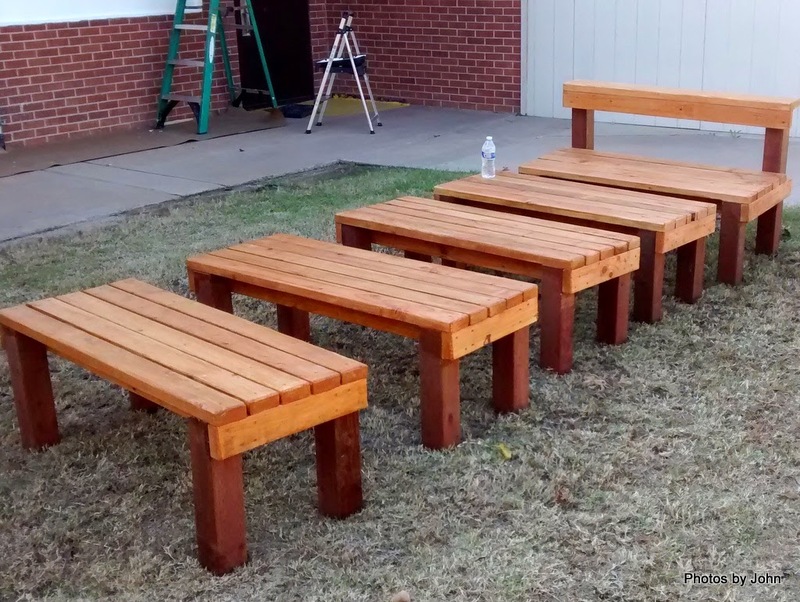 My team was tasked with building some benches to be scattered about the campus of Unlimited Potential. I was concerned about safety and made sure people knew safety issues with the tools they were using. Turns out, I should have started with things like "righty-tighty, lefty-loosey" and "make sure the driver is fully engaged in the screw head before pulling the trigger." That said, the team members were quick learners and very effective team players. It wasn't long before the project manager was looking to "borrow" some of my team to support other projects on campus. 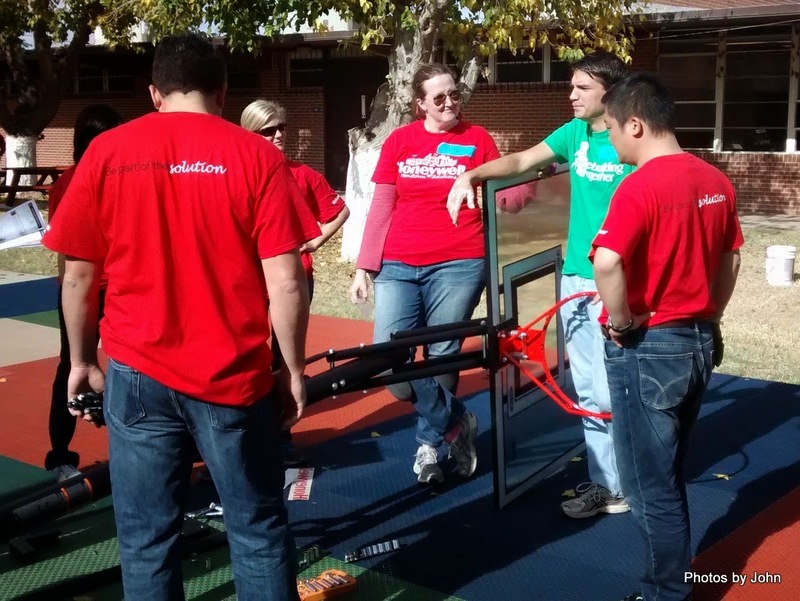 completing a raised rim and refilling of the existing sandbox while others were staining some newly assembled picnic tables. 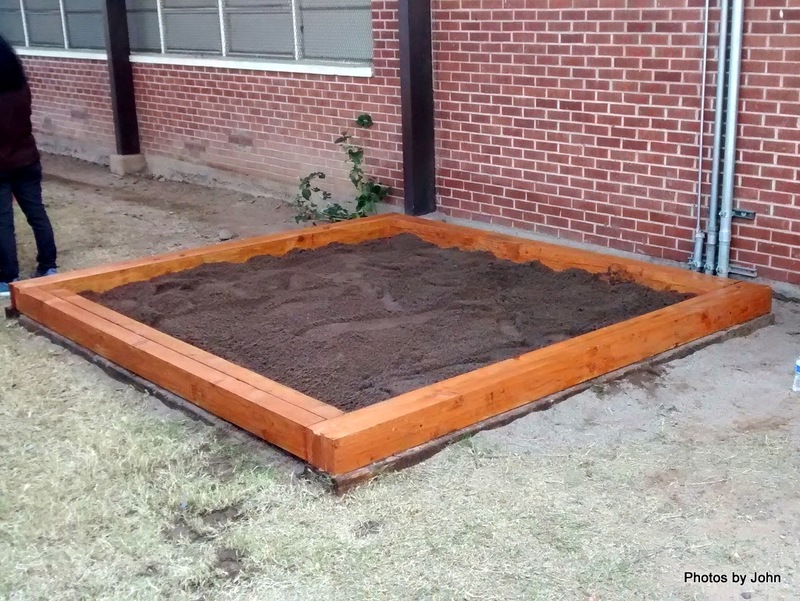 Other teams installed raised planting beds, complete with tomatoes, basil, and something else that I forgot. Other teams did some painting around the former grade school campus. Another team installed matting on a small sports court and assembled a new basketball standard. 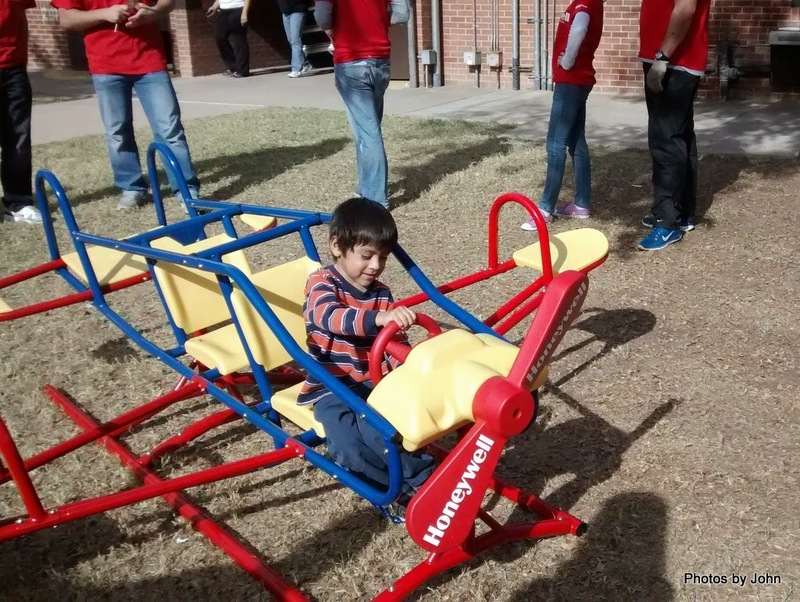 The airplane teeter-totter was a big hit, but only one kid was willing to try it while we were all standing around watching. 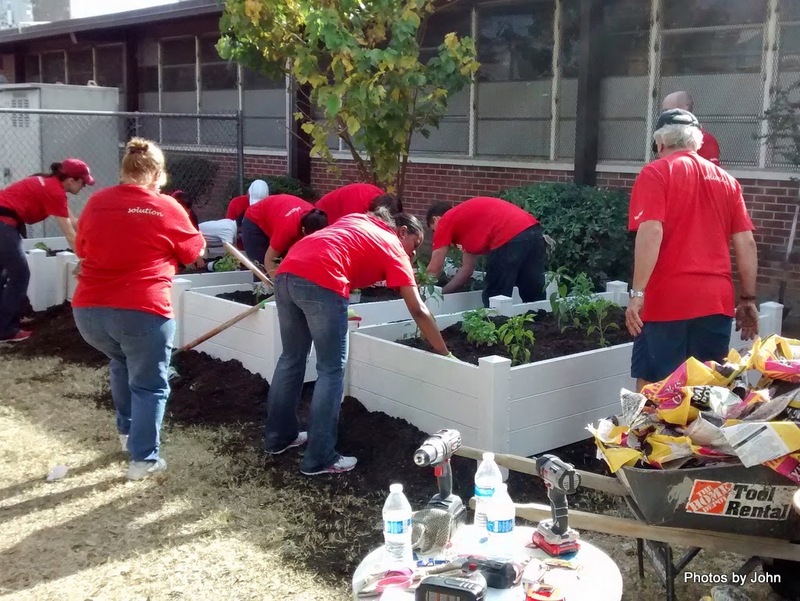 There were lots of other small projects also completed that day, all of which will help Unlimited Potential to better serve their clients. Meanwhile, I'm totally enjoying a chance to use some skills to help others. Once upon a time that doesn't seem so long ago, BJ wanted an excuse (as if she needed one) to be a stay-at-home Mom of grown kids. She made a deal with an expectant co-worker and left her job pampering pets to care for this young fellow while his Mom worked. For a while, it was almost as if he'd become our third child. Once he started school we didn't see as much of him except at birthdays and hockey, soccer, or lacrosse games. 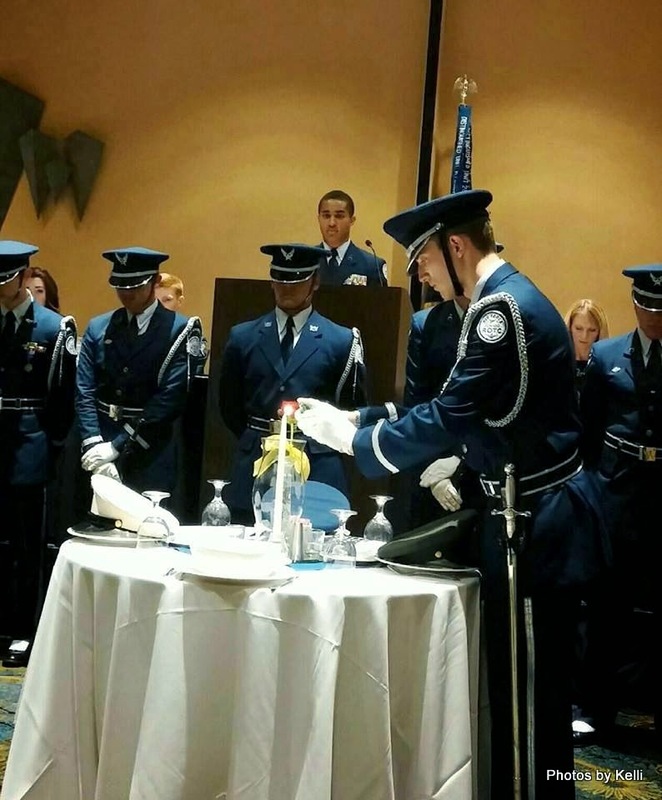 He has been actively involved in his High School Junior ROTC program. 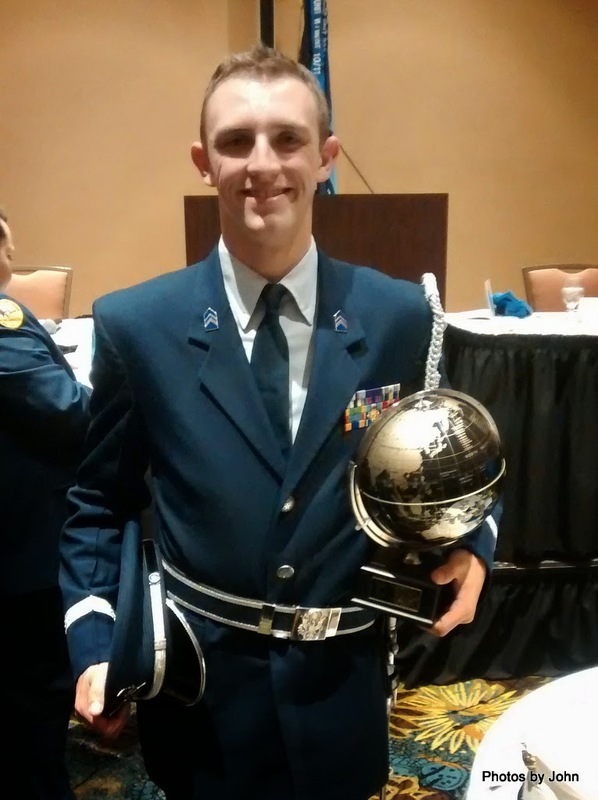 We had the opportunity to attend his senior year "Dining Out" and awards ceremony a couple weeks ago. 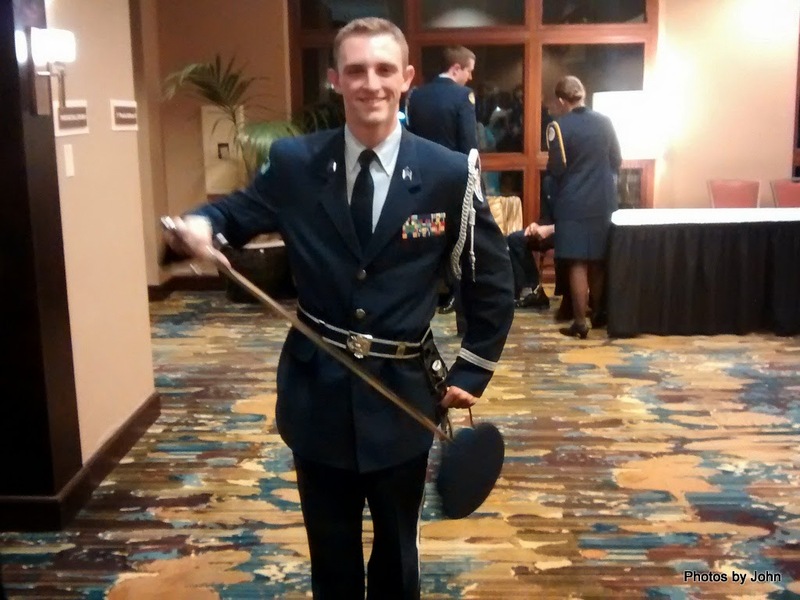 He has dreamed for years of serving in the military after he finishes High School. 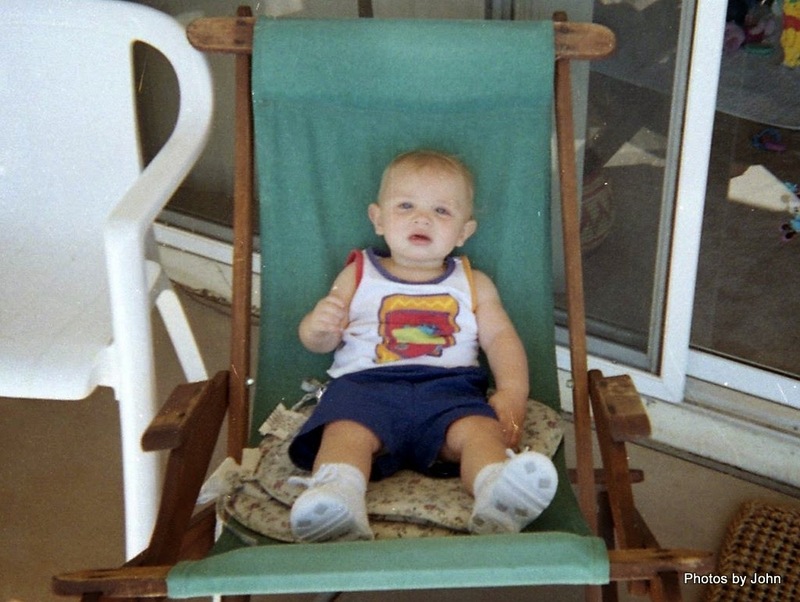 The minute he was old enough, he was in discussions with the Air Force recruiter regarding a deferred enlistment, but in spite of his excellent grades and accomplishments, the Air Force turned him down because of his eyesight. 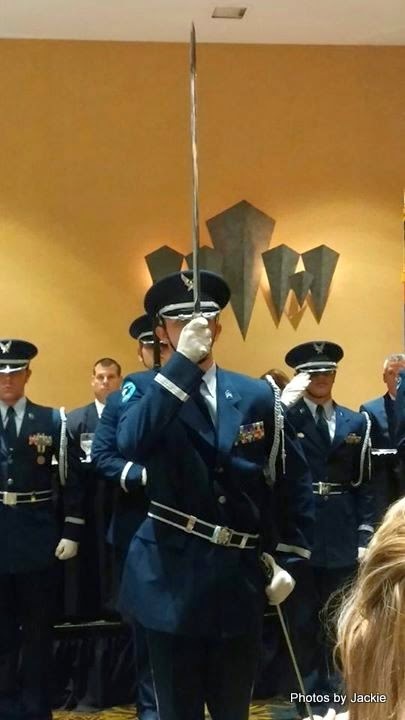 This young man was selected to serve as Commander of the Honor Guard for the MIA/POW ceremony - a very moving and integral part of the Dining Out experience. With the Air Force turning him down, he headed to the Navy recruiter for a similar discussion: enlist now , and start basic after his High School graduation in June. The Navy looked at a highly qualified recruit and also turned him down based on his eyesight. His parents and guests were surprised when he was selected as POC Student of the Semester for the second year in a row. These awards were in addition to the "Most Improved Cadet" award that he won his Freshman year. Three awards in four years, but it seemed the U.S. military establishment wasn't interested. But the third time was a charm. A couple days (or so it seemed) after Dining Out, he received word that the Army was interested. He's off to Fort Benning for basic training after his High School graduation and then anticipates training and assignment to tanks. He's excited, and we're very proud of this young man, his diligence and willingness to persevere. The original seat in my solo canoe has led a hard life. I slipped getting into the boat several years ago and broke the frame. 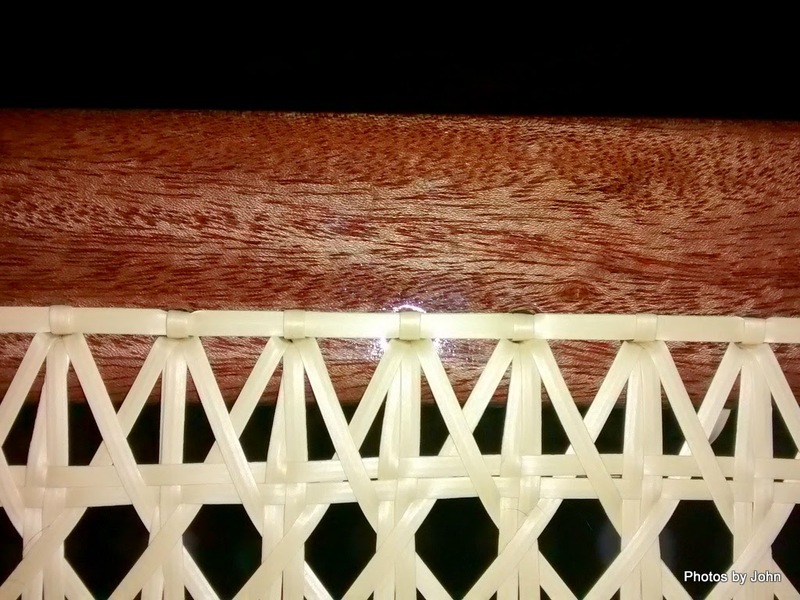 I fixed that with a laminated doubler, but now I see the caning is weathering and some strands have broken. It's time for a new seat. 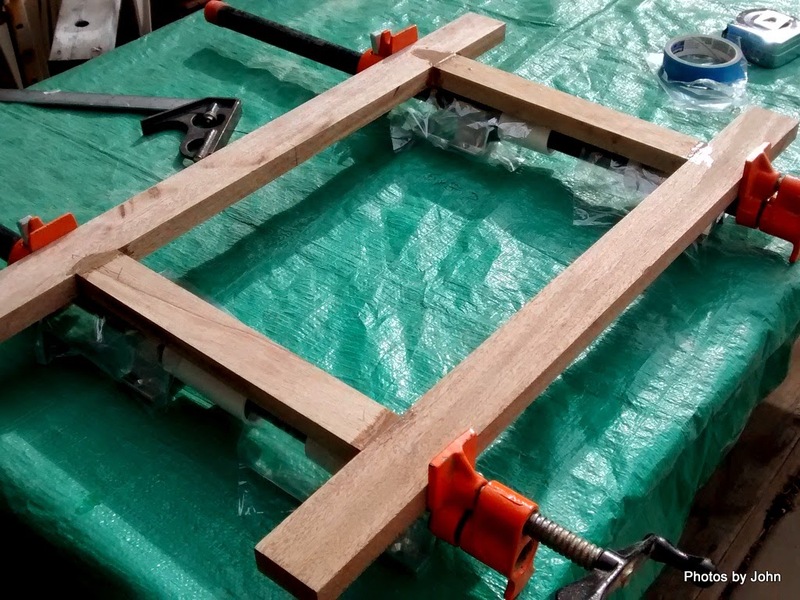 This time I built the seat frame from mahogany with mortise & tendon joints glued with epoxy. The wood frame is heavier than the original Alaskan Yellow Cedar frame, but it's also much stronger. 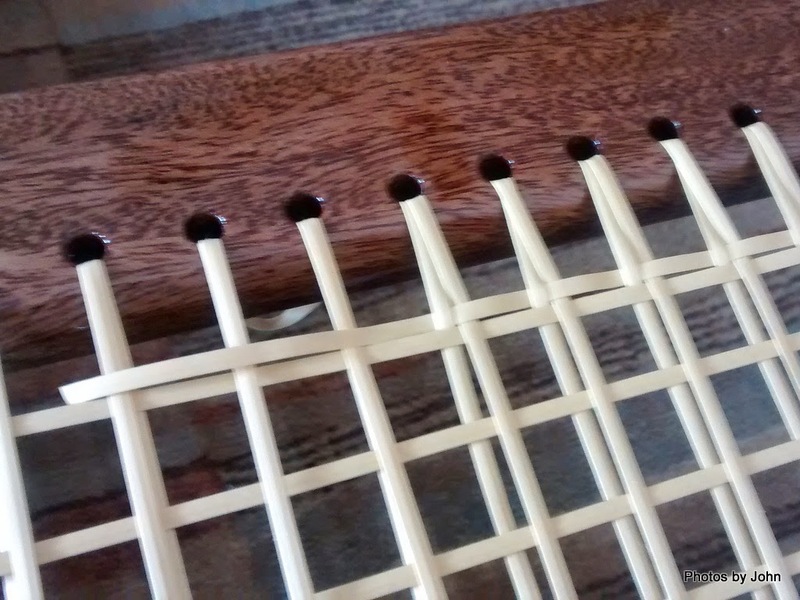 I used an earlier version of Gilpatrick's Building a Strip Canoe for the caning technique. After drilling the holes, I put one coat of epoxy on the frame and three coats of varnish before starting the caning process. 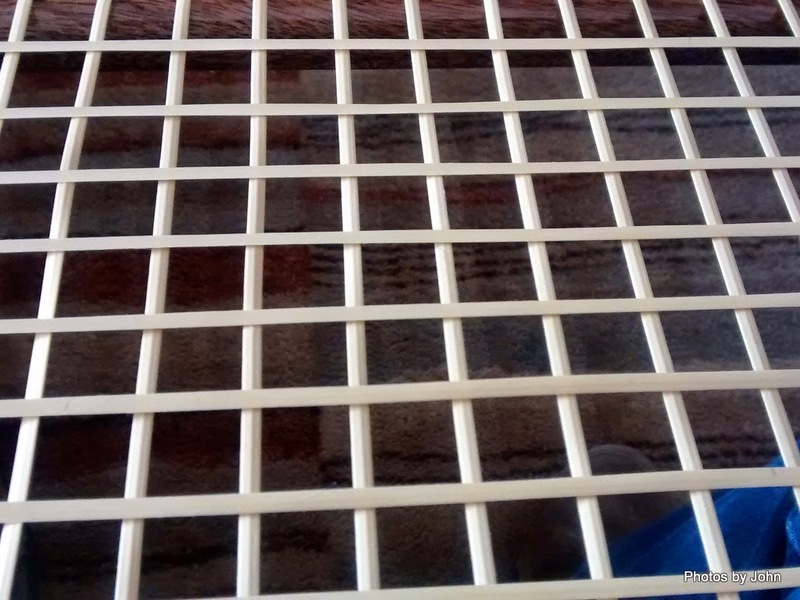 I used plastic caning because that's what I had on hand and because it doesn't stretch like natural cane does when it gets wet. I wish I'd been a bit smarter when I made the frame. Dimensions that were an exact multiple of 3/4 inch would have resulted in consistent hole spacing. 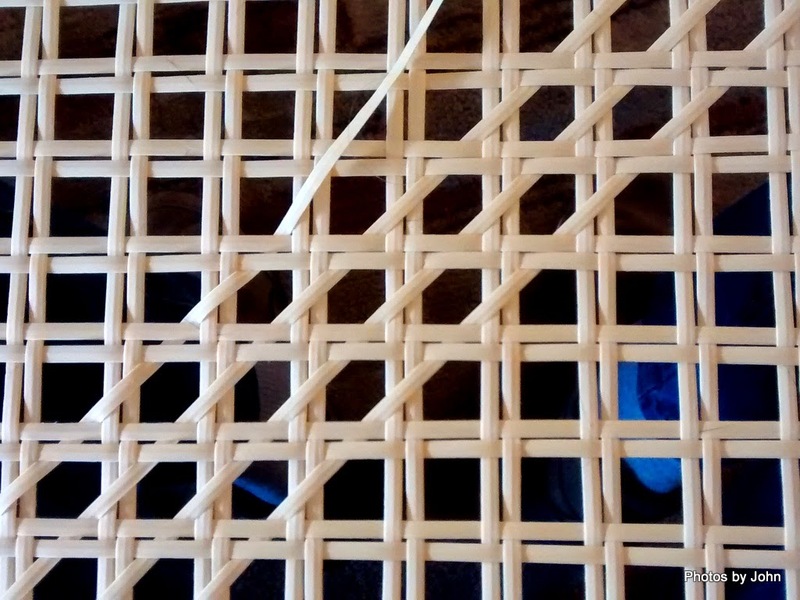 Caning starts from the center of one of the long sides, working back and forth across the frame, using tapered dowels to temporarily hold the cane in place. 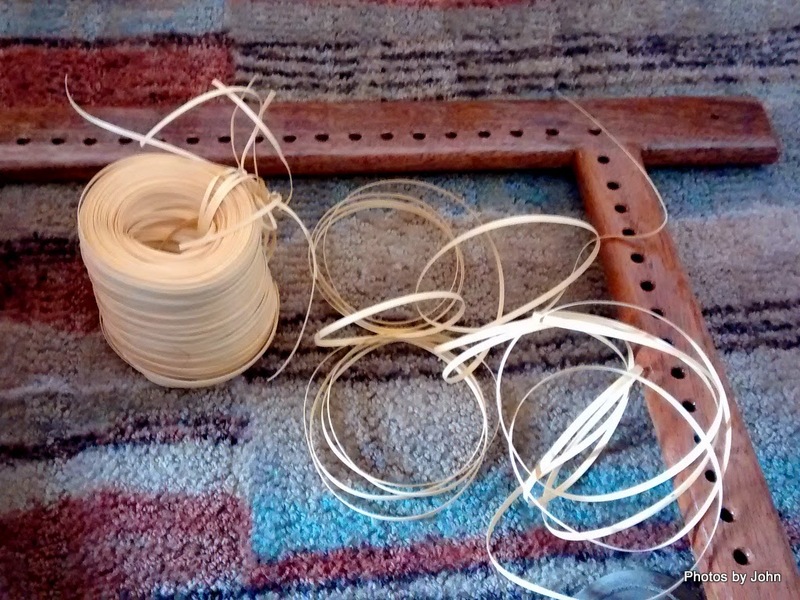 With the cane in place, the ends are tied off on the back side using a double half-hitch. After doing a single pass north to south it's time to put in a single pass east to west, and then another layer of north to south on top of the first east to west layer. The fourth layer is actually the first that is woven, going over the top of the upper north/south layer and under the lower north/south layer. All six layers are in place. 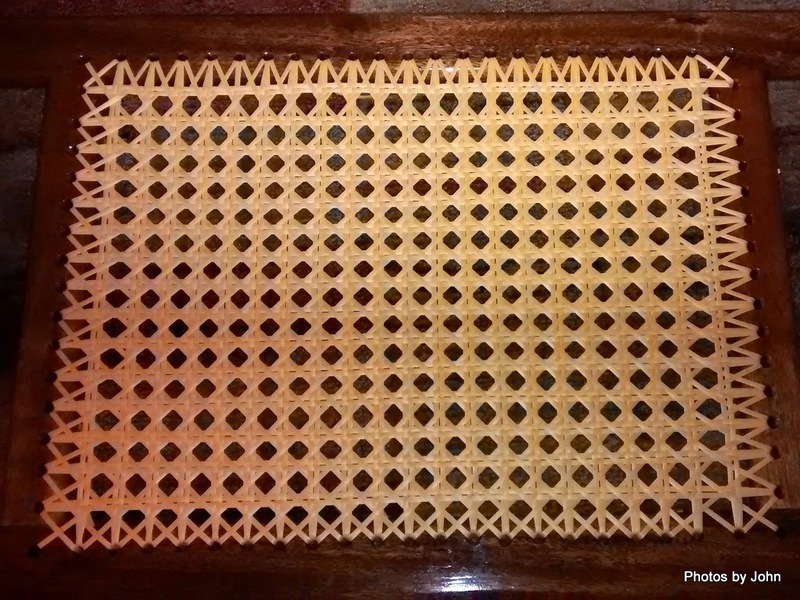 This is where it shows that the hole spacing at the ends of the ends of each row is larger than the 3/4" of the majority of the rows. If I keep sitting on the seat, no one will notice. 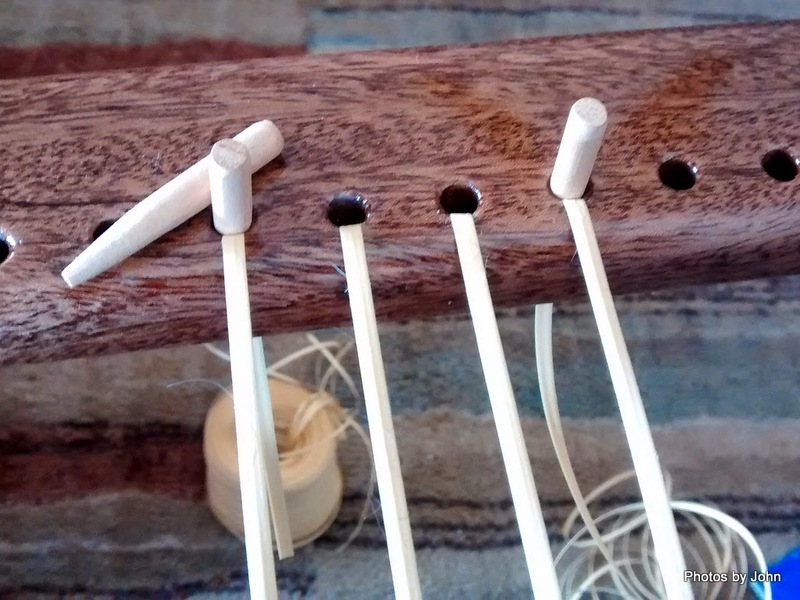 The last step is to install the binding around the edges. With the canoe all cleaned up and back together, I can hang it back up in the garage and give BJ her parking spot back. Whew - I've Got Gas!